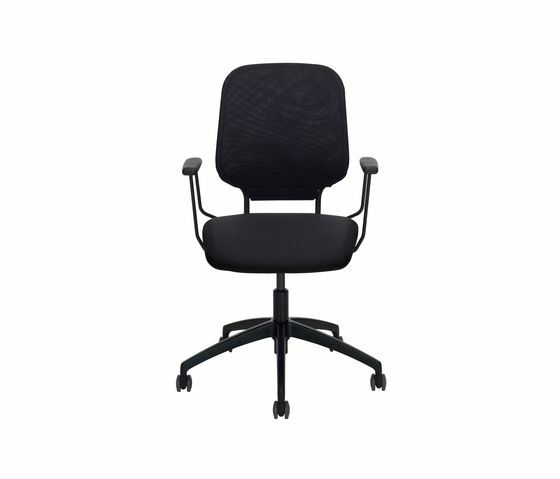 SAVO Invite – uniquely comfortable meeting and visitor’s chair: SAVO Invite has a unique function that supports the lower back even when leaning back. When pressure is applied to the back rest, it slides down and along a track. As the point of rotation is at hip height, the movement feels natural and gives the same support no matter how tall you are. SAVO Invite is available with a polished, white or black base on glides, or castors for soft and hard floors. With or without armrests. Armrests available in black, white, fabric covered or polished as additional. There’s a single lever for height adjustment. The chair is also available in a higher model, SAVO Invite High. It features glides and may be equipped with a footrest. The backrest is available in mesh or fabric as standard. The seat in fabric or leather. The way we work is changing. More and more, the office will become a place for meetings. As meeting areas become workplaces, it’s more important than ever that meeting seating provides good sitting comfort. SAVO Invite has been developed with exactly that in mind. It’s based on our philosophy for office seating. That means creating a chair that is really comfortable for backs, shoulders and necks, as well as pleasing to the eye. Our guiding principle is the total experience. SAVO Invite is an environmental friendly chair. It meets current environmental standards at the highest level. SAVO Invite also has the new Möbelfakta labelling.